Japanese Prime Minister Shinzo Abe was expected to keep key ministers in their posts in a cabinet reshuffle in Tuesday, including finance, foreign affairs and the economy minister who has handled knotty trade talks with the United States. Abe, who returned to office in December 2012, was re-elected as leader of his Liberal Democratic Party (LDP) last month, putting him on track to become Japan's longest-serving premier. Abe's reshuffle appeared to focus on stability as he prepares to push ahead with his controversial attempt to revise the post-war, pacifist constitution, political experts said. Abe has said he wanted to retain allies in Deputy Prime Minister Taro Aso, who doubles as finance minister, and Chief Cabinet Minister Yoshihide Suga. Media reports said he would also keep Trade and Industry Minister Hiroshige Seko, Foreign Minister Taro Kono, and Economy Minister Toshimitsu Motegi. Abe will tap Takeshi Iwaya, a former parliamentary vice defense minister, to replace Itsunori Onodera as defense minister, according to media reports. Iwaya has been in the public eye recently for backing the legalization of casinos in Japan. Close ally Akira Amari, a former economics minister who resigned over a funding scandal in 2016, was appointed LDP executive in charge of election strategy ahead of critical upper house elections next year, party officials said. Abe's administration suffered a blow when an opposition-backed politician defeated a rival heavily supported by Abe's ruling bloc in Sunday's election for governor of Japan's southern island of Okinawa, host to the bulk of U.S. military forces in Japan. The winner, Denny Tamaki, opposes a U.S.-Japan plan to relocate the U.S. Marines' Futenma air base to a less populated part of Okinawa and wants the facility moved off the island. 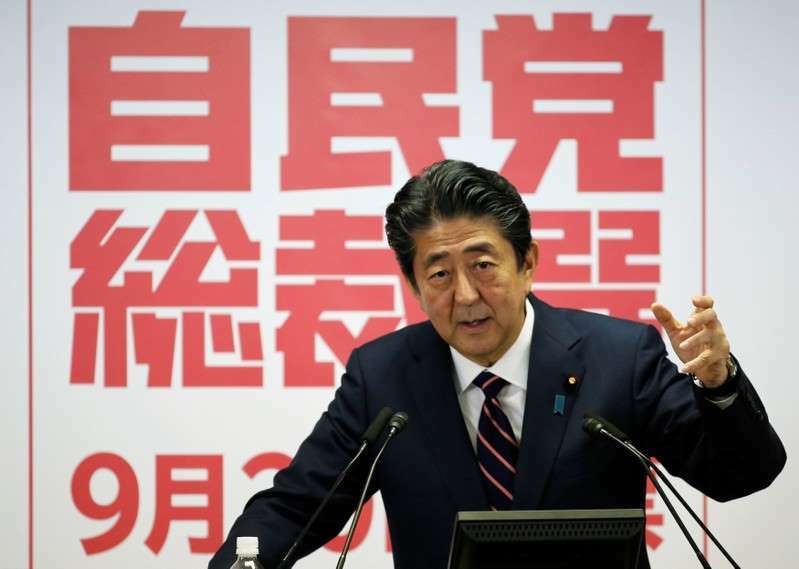 Abe has made clear that he wants to forge ahead with his politically divisive plan to amend the constitution's Article 9 to clarify the ambiguous status of its military, known as the Self-Defense Forces (SDF). Business confidence among Japan's big manufacturers worsened in the September quarter to hit the lowest level in nearly a year, a closely watched central bank survey showed on Monday, as firms felt the pinch from rising raw material costs and a string of natural disasters that disrupted production. Last week, Abe and U.S. President Donald Trump agreed to open new talks on a bilateral trade agreement that would see Washington refraining from raising tariffs on Japanese car exports for now, but Trump could revive the threat if progress is slow. Abe was also likely to appoint former finance ministry official Satsuki Katayama, a conservative LDP lawmaker, as minister in charge of local economic revitalization.